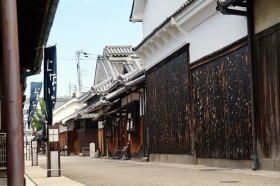 Jinaimachi town in Tondabayashi, where a large number of old wooden residences of merchants in the Edo era (1603-1868) still remain. 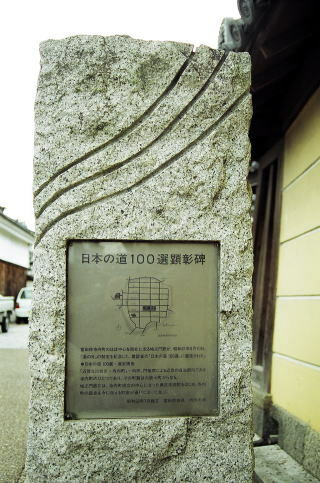 The Jyounomon-suji street north to south through the center of town, approximately 400 meters’ distance, was chosen as "the 100 selections of roads in Japan" by commemorating the 10th August of the Day of roads in 1986. 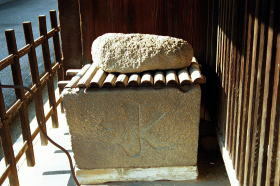 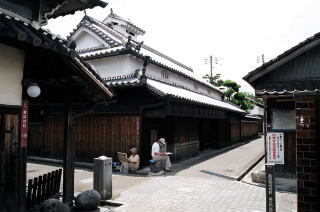 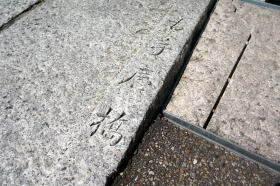 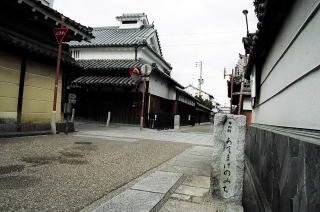 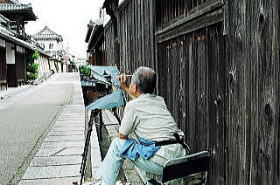 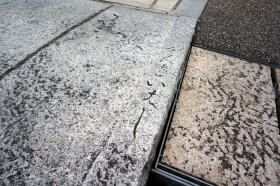 The name of Jyounomon-suji street, which literally means the street in front of the gate of castle, has been derived from the fact that the main gate of Koushouji Betsuin Temple facing the street in the center of town, is said to be removed and rebuilt from that of Fushimi castle Hideyoshi Toyotomi constructed in Kyoto. 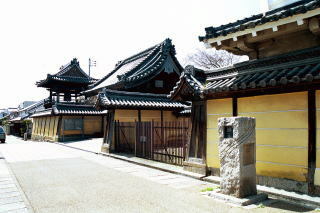 The academic investigation of 2012 confirmed that the gate was constructed in the Azuchi-Momoyama period, approximately 1558-1600, which is more likely considered as the remains of Fushimi castle, and it was re-relocated from the head temple, Koushouji Temple in Kyoto, to Jinaimachi, according the record. 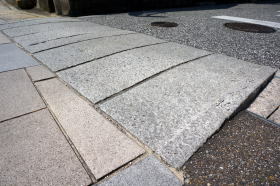 As for the current road, being named Route 6 of the municipal road, the stone pavements have been maintained, and telephone poles and electric wires along the street are transferred to the position where most are not outstanding. 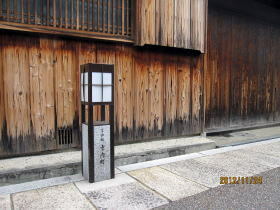 You can remember the landscape in former times, as they were. 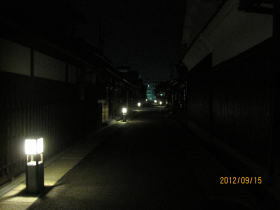 In addition, the street is lighted up by lamps placed in a row on the road a street at night. 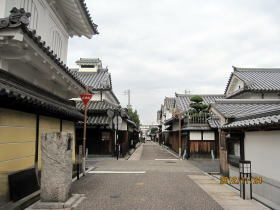 In Osaka prefecture, the Midou-suji Street (Osaka city) and the Phoenix-dori Street (Sakai city) have been also selected as the 100 roads of Japan, other than the Jyounomon-suji Street. 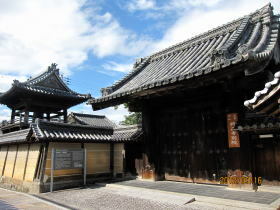 Looking towards Tondabayashi Gobo (Koushouji Betsuin Temple) from Tomiyama-choand Dake mountain is seen in the center. 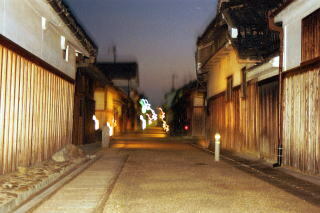 The street is lighted up by lamps placed in a row on the road a street at night. 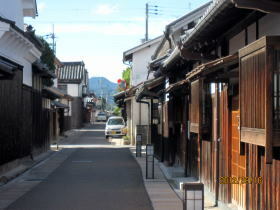 The streets in the town area are laid out in a grid running north-south and east-west, and the original town planning has been left at present. 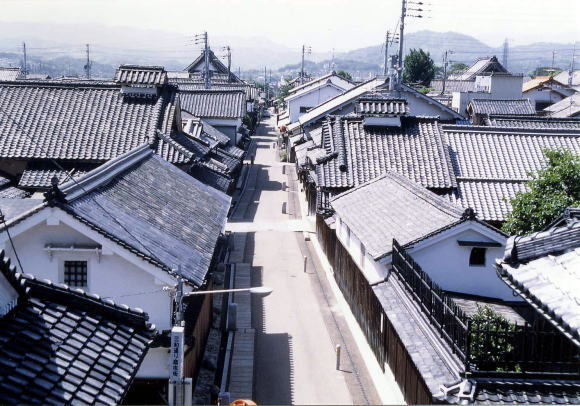 For the security reason, the two streets crossing at right angles were slightly deviated on purpose, then the structure made it difficult for foreign enemy who invaded the town to foresee straight a distant place. 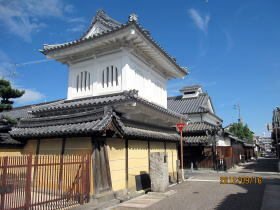 The structure was often seen in castle towns at that time. 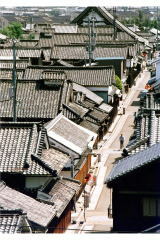 Youjin-Bori literally means a ditch of precautions against fire. 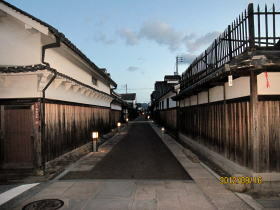 A moat of precaution (a culvert) is placed along the Jyounomonsuji street, and the stone bridge across the moat is named as Gan-ei bridge, praying for the prosperity of Iwase-ya forever. 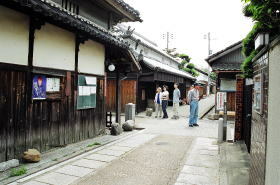 Jinaimachi town of Tondabayashi was originally developed as a religious mission town with autonomy during the age of provincial wars in Japan, approximately 1467-1590. 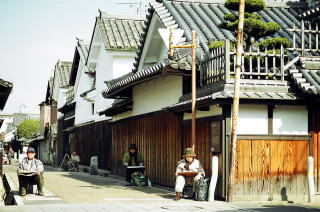 The town is located at the hilltop of river terrace of Ishikawa River. 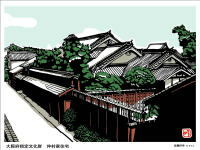 Therefore, water supply was insufficient, and the residents of the whole town had extremely paid attentions on the prevention of the fire. 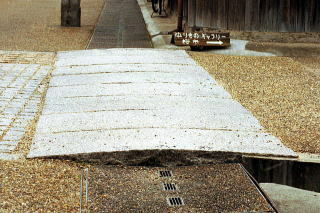 There are ditches keeping firefighting water called the Youjin-Bori in Ichiriyama-cho and Tomiyama-cho in the north as well as the stone signpost at the entrance of town, describing the cautions that visitors are not supposed to walk around in smoking and to carry a cord being ignited in the town. 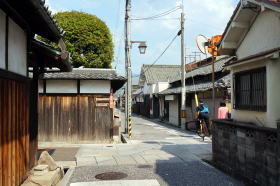 Those facilities are understood for the residents to have protected the town for a long time, considering mutual benefit and prosperity of the community. 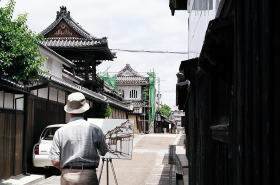 Such considerations might be one of the reasons why the old townscape was left and preserved as it used to be. 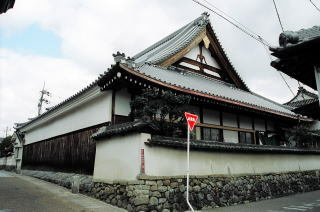 The house in the town is built facing the street called “cho" running east to west, and there is still a neighborhood organization grouped by the houses of both sides of the east-west road. 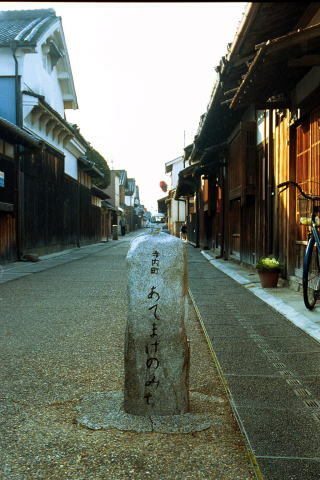 As a boundary of residents’premises, the waterways of drainage called Sewari-suiro separate blocks of the town, which start from the Jyounomon-suji street for east-west directions respectively. 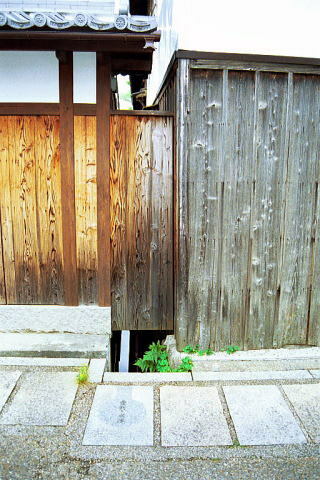 Sewari literally means separating the backsides of both premises next door. 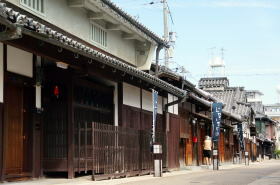 The summer street lantern festival in Jinaimachi. 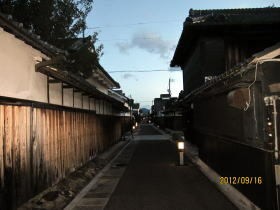 In the evening of last Saturday in August every year, approximately 1,000 lamps with a paper shade are displayed on both sides of the street of the Jinaimachi town and are lighted all at once. 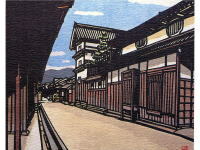 Many visitors come on that day and it is very popular as a local summer event. 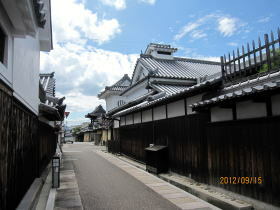 It is jointly organized by the local association for preservation and development of the town. 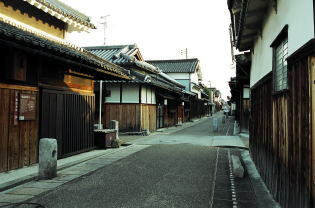 The town was developed in all directions around Koushouji Betsuin Temple or Tondabayashi Gobo, laying out the grid-shaped town plan with seven streets called suji and eight avenues called cho. 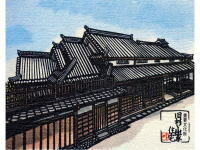 Suji runs north to south and Cho runs east to west. 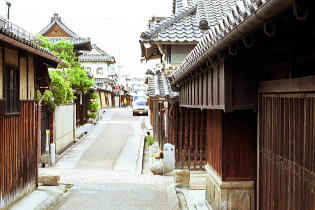 The seven streets of suji are, in order from east to west, Higashi-suji, Kamegasaka-suji, Jyounomon-suji, Tomi-suji, Ichiba-suji and Nishi-suji. 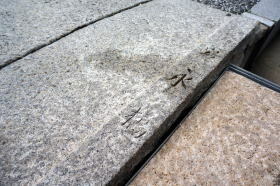 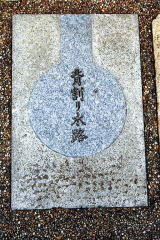 The remaining suji was a little narrower in width than the others and its trace and name was disappeared. 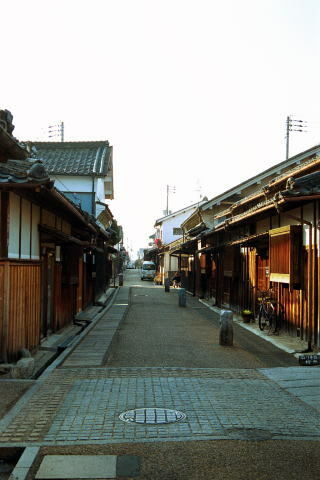 The eight avenues of cho, in order from north to south, are ichiriyama-cho, Tomiyama-cho, Kita Kaisho-cho (north Kaisho-cho), Minami Kaisho-cho (south Kiasho-cho), Sakai-cho, Gobo-cho, Nishi Hayashi-cho (West Hayashi-cho) and Higashi Hayashi-cho (east Hayashi-cho). 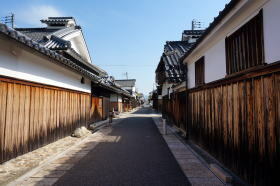 Hayashi-cho was divided into the east one and the west one during the period of 1753-1778 and then the town has eventually consisted of six streets of suji and eight avenues of cho. 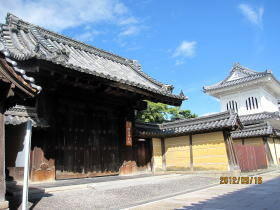 You will note that you will contact Tondabayashi Municipality Office for a parking lot of large tourist bus for groups. 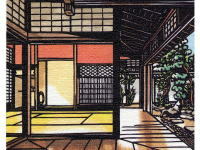 Thank you in advance for your kind cooperation. 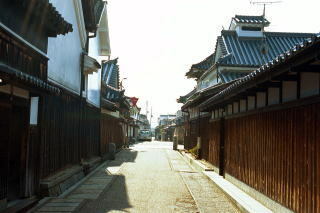 copyright©2002-2020 富田林寺内町の探訪 all rights reserved.